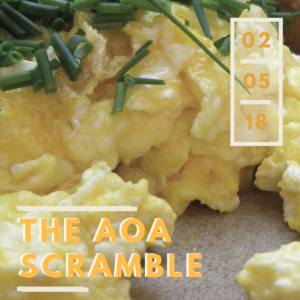 On Monday February 5th the AOA Match will release its results into the wild, causing joy and unfortunate scrambles. It’s no surprise that the DO version of SOAP is therefore called the Scramble. If you’re anything like me, you’ll be spending this weekend quietly freaking out worrying you’ll have to Scramble. What defeats worry? Being prepared. Here’s the data you need. Don’t go into battle without knowledge. On the AOA NatMatch website you can find an overview/guideline of the “Post Match Procedure,” under the Applicants tab. On Monday, if you didn’t match, you’ll want to have this already printed out and memorized. Bookmark the AOA Available positions page and AOA’s program details page, oddly entitled Opportunities. Know that on Monday, you can, and should, contact programs and let them know you’re interested. This is no time to be shy. Research if and how your school will help you – especially if you’re off-site. Many schools will have pre-emptively emailed you about this, but if not call your school’s Match coordinator. If you’ve never used Skype or FaceTime, learn how today or tomorrow, not on Monday morning. Don your armor, and gather your weapons. Break out your laptop and plan for access to WiFi that’s reliable. If you don’t have an account, install and setup Skype on your computer today. Check your location to ensure you’ll be well lit (if not, adjust that desk lamp) and don’t have a huge mess of dirty laundry piled behind you. Press your blouse and blazer today, and don’t skip the shower Monday morning. There’s a possibility you’ll be quickly offered telephone, FaceTime or Skype interviews. So get up early and be prepared. Drink and be merry, for Monday is not today! You’ve prepared as best you can for an undesired outcome. Now, you can do nothing more. So put aside your worry and relax. Drink a glass of wine (or some lime soda and cranberry, it’s quite refreshing) and chill out with your favorite Netflix show. Keep on texting your fears and consoling friends, because that’s all you can do, and that’s okay. Finally, remember that for most applicants into family medicine, you land in your top three. That’s a good place to be.